Especially in light of increasing public pressures not to spank children, parents are legitimately questioning whether or not spanking should be a part of their repertoire. As parents who seek to train up our children as God has prescribed, we must look to His word as our authoritative source for parental training. Thankfully, the Bible has much to say regarding parental discipline. But can it bring clarity to the question of spanking? Does the Bible teach that parents should spank their children? I believe yes, and yes—but with very specific parameters and limitations. The Bible is quite clear about disciplinary method, purpose, and results. Biblical discipline is always to be conducted in love and for the purpose of the growth and godliness of the one being disciplined. It is never punishment, and never abusive. It is painful, yes, but should never be harmful. Over the course of five articles I will consider in detail five very direct passages pertaining to the physical disciplining of children: Proverbs 13:24, 22:15, 23:13-14, and 29:15, and Hebrews 12:5-13. As this series begins, I must preface it by noting that many events of the Hebrew Bible take place under the economy of the Mosaic Law, and because that Law governed Israel as a nation and not church-age believers of today, we need to be cautious to properly understand Old Testament context. We certainly don’t want to misapply a principle or a mandate. But the book of Proverbs makes things relatively simple. Proverbs is filled with universal truths not restricted to any particular era or economy, but broadly applicable to God’s people in any age. So, we begin there. The Hebrew shebet, references a rod or staff, used typically in the pastoral setting as a physical restrainer and teacher for the governing of a flock. The one who hates his son is withholding (Heb., cho-sek, participle) the rod from, or refraining to use the rod on his son. Hate (Heb., sane) is a prominently used word indicating a disposition one might have toward an enemy. In a literal grammatical-historical understanding, the meaning of the phrase is crystal clear: withholding the rod of discipline is simply hateful toward a child. By contrast, the one who is loving (Heb., ahav—here in the participle form) his son disciplines diligently. The Hebrew shahar (is diligent) is a verb in the Piel stem—a stem that is intensive or emphatic. The phrase could be accurately translated as, “The one loving his son is a very, very diligent discipliner.” A discipliner in this phrase is contrasted with the withholder of the rod in the previous one. The simple question implied for parents is this: “Do we or do we not love our children?” We do so (at least in part) by providing them discipline (Heb., noun, musar—reproof, chastening, or correction). In this context there is but one litmus test for parental love. (1) Proper discipline is associated with the use of the rod. How much and how forcefully, and when to apply the rod and for what purpose, are issues not addressed in this particular passage. We can’t even assert from this passage that the rod should be the exclusive method of discipline. Such an assertion goes beyond the text itself. Nonetheless, the association of the rod to proper discipline is undeniable. (2) Proper discipline is associated with love. The reasons are not explained in this verse, but the only passages in Proverbs that mention parental love (3:12 and 13:24) describe the expression of that love in terms of discipline. Whereas punishment may be associated with retribution and wrath, discipline is not related to those ideas. (3) Proper discipline is not described here in terms of abuse or causing harm, nor is it described as punishment. Likewise, God does not punish His children; instead He disciplines them. There is no condemnation for those who are in Christ Jesus (Romans 8:1), and punishment is related to condemnation. On the other hand, discipline is for training up in righteousness—and that is an important part of every believer’s walk. 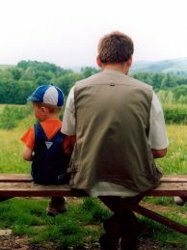 Since God exemplifies righteous fatherhood, we should, of course, seek to emulate His approach with His children: discipline is to be conducted as an expression of love for the spiritual well-being of the child, and punishment should have no place in the parental vocabulary of the believer. We begin, then, to catalog the principles, until we have examined each of the related passages in order to understand how the principles complement one another, and finally to address the questions of how spanking is to be utilized by the believer, if at all. While I hope to clarify some of these things as the series progresses, I challenge readers not to wait for me—and not to simply rely on my words, but rather to search these things out on their own. If these articles accomplish anything at all, I hope they challenge readers (1) to value the Scriptures as the ultimate guide for parenting (and even life itself) and (2) to be diligent in searching its pages. I appreciate the essay and the series. Some even try to affirm both of these at the same time. In any case, I'm interested in what you'd have to say in response to these views of "the rod" in Proverbs. I, like Aaron B., am curious about how you (Christopher) would address the idea that "rod" is to be taken metaphorically and not as a literal rod. I am sure that unlike myself, Aaron has a solid, exegetical understanding of his own on this point, but I am still developing mine. I have an experiential answer, but all experiential answers are, of course, subject to the exegetical one properly arrived at. Thanks in advance! 1) It is a metaphor for discipline that is "not pleasant" (to borrow from Heb. 12.11... and since "painful" seems to make so many break out in hives). 2) The metaphor does not exclude a few whacks on the behind or going to bed w/out supper once in a while. Certainly, during the times when these passages were written (and for every century thereafter until the 19th and 20th), people would not have been squeamish about using a little pain to teach a child things that will save him or her enormous amounts of pain later in life. The Rod & the Sword; a few thoughts on ages. I liken this to the Sword in Romans 13. In the time Romans 13 was written, a likely weapon for execution would be a sword. So it’s literal. But nobody would make the mistake of thinking that government always has to execute you. There are lesser penalties for lesser offenses. The ancient mind would reason it this way: “If they have the authority to use the sword (that’s take a life in execution), they certainly have the authority to provide all lesser penalties as well.” So the sword is not only a literal sword, but also a symbol of the entire range of punitive options the government has. Similarly, the rod is not only a literal rod, but symbolic of the entire range of disciplinary options. If you have the authority up to the rod for punishment, you have the authority to provide all lesser punishments. Now, regarding ages involved, I think that SOME of the Rod passages use a Hebrew word that generally refers to young adults. Proverbs 22:15, 23:13-14, and 29:15 all contain a Hebrew word that should almost always be translated “youth”, with reference to young folks typically from ages 16-24, roughly. There are some exceptions, like when referring to “Jewish royalty” – people like Moses, Samson – the word can be applied to infants. But generally speaking, it applies to older teens and young adults. So, the majority of the verses that refer to the rod are with reference to ages far above small children. I’m not saying that’s always the case, but it’s a pattern that’s strong enough that it should give us pause. In fact, the Jewish rabbis of ancient times frequently admonished people not to apply any verses about the rod to children before the age of 10. This does not mean they were right, but their perspective was probably influenced by these passages and the word used in them. Misinterpretations also arise. The KJV's rendering of Proverbs 23:13-14 refers to saving a child from Hell. The Hebrew is probably warning about saving a young man from death - as in keeping him from criminal acts that will result in his being sentenced to stoning under the Mosaic Law. I am a traditionalist in the sense that I believe spanking, wisely applied, is an option. I simply believe it is not the only option. And that a lot of bad preaching has arisen on this under-investigated topic. Haven't had a chance to study out the age related words in Proverbs yet. But speaking from experience, I think we may have some of this backwards. By the time a kid is 16, he/she is able to understand far more sophisticated forms of discipline. But a three yr old cannot be reasoned with. This is one pt. where some of the efforts to develop parenting strategies from idealized theological premises (rather than from what Scripture actually plainly says on the subject) border on ridiculous. You can't have a chat w/2 yr old junior about law and grace when you need him to stop hitting his sister or running off at grocery stores or screaming loudly at the table when adults are trying to converse. He can't understand that kind of reasoning. He can understand pain, whether it's the pain of losing access to some cherished item he's clinging to, or being removed from adult company or a slap on the wrist. Though it's true, as the critics say, the kid may think it's all about Mommy and Daddy's disapproval rather than being about sin and salvation, that's really not a problem at that point. Abstractions are for later. What they need to learn as small children is to begin to acquire clear distinctions between right and wrong, based very much on what Mommy and Daddy say. we learn a great deal on the basis of authority long before we learn it from personal conviction and reasoning. You have to talk to kids at their level. So I'm very skeptical of the value of corporal punishment for older kids. My son, who is 10 now, benefits from it once in a great while (I think I spanked him once in the last year and half--probably not enough), but he is old enough to look at his choices in terms of personal belief, love for God, honor where honor is due, and the gospel. The rod has become a secondary means of reinforcement--a dose of reality--when those ideas don't yet seem real enough. As for the parenting strategies extrapolated from theological ideals: even from that POV, you have to learn law before you can learn grace. Gal. 3.24. The metaphor does not exclude a few whacks on the behind. . . When a figurative vehicle (in this case, the rod) is included in the category for which it stands (discipline), it is more properly termed metonym than metaphor. Remember the famous caning case in Singapore a few years ago? An American teenaged tourist named Michael Fay committed the crimes of theft and vandalism there. He was sentenced to caning – being beat with a rod on the back 6 times. Americans were horrified. But customs in the east and in ancient cultures run to more stern treatment than we are used to. Again, the word “child” is the English translation, even though the Hebrew word probably is referring to a young adult male. Read that way, he is saying if you punish your older teen or young adult with the rod, he won’t die – in fact, you’ll save his soul from death. In the Old Testament law, there was provision for an ultimately defiant young adult, wild, evil, drunken, violent, disrespectful. In extreme cases, the young adult might be executed by stoning. In our society, we have the police to serve the same purpose, and we don’t typically stone our young adults for being drunk and disorderly. This is NOT to say that we shouldn’t spank kids. I’m just saying that a few verses typically used to justify spanking small children are probably about something else. There are still others in which a Hebrew word is used whose dynamic range would indicate that the spanking of small children is an appropriate option. Most of our means of discipline are loss of privileges, imprisonment, and physical punishment but on a smaller scale than what adults experience. After all, what is 'time out'? Or being sent to one's room? Or being restricted from the use of a phone, computer, tv, car...? That's what happens in the adult world when you break the law- you lose privileges, your freedom, and quite possibly your life. Civil law/crime & punishment is quite a different thing from parental discipline. I suspect some of the Proverbs may have the former in view, and some certainly have the latter in view. Prov.13.24 is certainly not about caning a criminal. On metonymy... yes, that may be a better word. "Inclusive metaphor" might be a little more clear to most people though. I understand that, but I was speaking of the consequences themselves that we use to teach right/wrong, not the relationships or the motivations for doing so. When we 'create' consequences, aren't we (along with the other bazillion reasons we discipline) also attempting to give kids some sense of what might happen if they don't learn to respect authority? Even if they never embrace the concept of right/wrong itself, most people have enough of a sense of self preservation to not break the law. Which is, of course, why Christ focused on the heart. The only reason some people don't commit murder is fear of the consequences, not their own personal moral compass. I also wish that fundamentalists would be more honest and academic about the Proverbs rod texts. Thank you, Mike Durning, for starting that. About Aaron's comments about spanking very young children--as necessary b/c they don't understand reason yet--well, it's just not necessary. It is pretty much behaviorism--do this, zap. do that, zap. There are tons of ways to teach small children to behave and that parents' words have meaning w/o the use of pain infliction. People can use spanking if they want, they are free in the Lord to do that. But they are just as free in the Lord not to spank, too. But they are just as free in the Lord not to spank, too. Of course they are. God doesn't make people love their children, but He does command it. Obedience to God then requires it. I've been saving this link for the next time this topic comes up on SI, so here we are!!! This is an interview with Elyse Fitzpatrick, author of, among other things, a book called Give them Grace: Dazzling Your Kids with the Love of Jesus, which she wrote with her daughter Jessica. She talks a lot about coming to understand grace and then how that applies to discipline. It's very good. She recalls overhearing this discipline moment with her daughter and grandkids. One little brother is beating up the other littler brother. Mom says something like, You need to love your brother! Brother says: I can't! Mom says, That's right; you can't. You need a Savior. And that's the truth. Even when you're an adult. I like too her explanation of grace and sanctification. I think this is one of the most misunderstood ideas in Christianity/fundamentalism. In your story Anne, the brother getting beat up on learns that the parent has no concern for justice. They don't love their son enough to spank him. They don't love their other son enough to teach him that justice is good. Yes... I was responding more to Mike in #7 and some other bits and pieces in the thread. My point was just that we can't use the civil law/punishment passages in Proverbs to explain away the parental ones. Apprently, God was in favor of alot of behaviorism in the Law of Moses.... Do this, zap. Do that, zap. Therefore, all use of pain in discipline is behaviorism. The reasoning is valid but both the first premise and the second are highly suspect--especially the first. I continue to hold that the parenting passages in Proverbs make no sense at all unless there is value in the use of pain to shape a child's character and, yes, his heart. Lectures in theology are not the only way to reach a heart... if that were the case, we might as well let kids do whatever they jolly well please until they're old enough to start taking in Soteriology 101. That's right; you can't. You need a Savior. Then the brother says "Yes, I do!" And continues hitting the other! The lesson in the gospel is a great one and well timed, but does not in any way solve the other parenting challenges in that scenario. Boy #1 has to learn not to hit boy #2 regardless of when--or whether--he becomes a Christian and learns to love him. I really doubt the mom let the brother continue hitting the other brother, and there probably were consequences for his hitting in the first place. it's really not that simplistic as people want to mock it up to be . . . We do have to learn to "be good," but we want our parenting to go beyond moralism. None of us are good, and it's tricky teaching the fulness of that to our kids. For example, it's really easy for me to be good, but then God had to take years of my life to teach my that I am bad, and that really, even my goodness never meets His standards. My acceptance before Him is all because of Christ, not my behavior. Under the NT, those who obey Him will suffer and that is how we show Him today to the unbelieving world. Have you ever studied any of the child developmental theorists? I don't have time now to do more than pique interest, but I believe the developmental stages and corresponding abilities should play a significant part in this conversation. Snippet: young children are generally unable to apply logic and reasoning to situations; they rarely grasp abstract concepts; and they tend to miss the process of events, focusing on the before and after instead of the in between. I have often felt that many of the positions you have taken on this topic sound wonderful in theory but are impractical, if not impossible, to implement in reality because the child is simply incapable of grasping what you are advocating. In my experience, it is unusual to have the Fundamentalists promoting notions like Behaviorism and the Stages of Child Development. Usually we Chrisitan non-spankers are told that we are basing our methods on *gasp* SECULAR *gasp* notions like these. I am quite familiar with Child Development and it supports the notion that toddlers do not benefit from being spanked. the problem lies in most people imagining that "no spanking" and "grace-based" parenting jsut means you lecture or talk to your kids of any age about deep gospel issues. This is a huge misconception. I look at the whole thing more as making childrearing a mainly non-punitive (non-punishment-oriented) discipline for the parent. My child does something s/he should not do, I, for example, remove him from the situation, remove the toy (even if he wants it), etc. It's not that I just sit and lecture him/her about this or that. I ACT. I get off my seat and do something that shows my child that my words have meaning and their actions have consequences. He throws little pieces on the floor, for example,...he then helps to pick them up. I study their ages/stages, what they are inclined to do naturally at certain ages, then I also can understand why they do irritating, aggravating actions at times and can come alongside and help them. Even when I know that I need to wait for something to be outgrown, it doesn't mean I just let a child wreak havoc around our home and on others. We are a family, and while we do bear with each others' weaknesses, there are definite behavioral boundaries. It has been very eye-opening in certain situation, rare, but when my child does something I know directly is sin, and then I realize later that he/she was just trying to communicate a whole different message but didn't know how to put it into words. So I do correct the sin, but I have been very thankful at those times that I didn't just spank or punish in a general sense, but rather I responded somehow then took time to probe into what was going on, even over a period of time. That's not a full answer, but I'm trying to give people the idea that "no spanking" doesn't jsut mean I subsitute that for theological lectures. Our 3yo nephew (with cerebral palsy) lives with us while his mom is in rehab. I am so, so thankful that God has led me into parenting views and skills that are non-adversarial, that train me to express love, patience, and understanding to my children as children, and that have set up boundaries around me so that I don't become abusive. All those cases where children died, they were adopted, and with our nephew, who will be with us fairly long-term, I see how easily the relationship could become antagonistic and adversarial, and pretty much focused on my asserting my authority (esp I see this after the honeymoon, you-poor-you, child-very-sick-from-neglect phase). We think those parents must be weird or deranged for going to those lengths to hurt those kids. ... That is how Satan and our flesh deceives us. We are not so removed from them, especially when it comes to trying to receive and train a child that has already been programmed in ways you will never know, has seen/heard/experienced things you will never know, and has been trained to act in ways you will never understand. The parent-child relationship can quickly desintegrate (sp?). I'm quite sure it's possible to cite child development experts taking directly opposite positions on a whole lot of questions. I think the point was that Piaget, for example, sort of formulated the obvious--that young kids are very concrete thinkers and abstractions are lost on them (I'm still in favor of telling them the abstractions, but not really as a method of correction. It's just a good habit to get into and you never know at what point they'll start getting it). But there is a pretty strong consensus that the mind develops in stages. For my part, I don't need an expert to tell me that. As for secular vs. not... It's not really possible to lump all ideas under the headings "secular" and "Christian" and reject all of the former and embrace all of the latter. You'll never hear an "it's secular, therefore false" argument from me. All secular ideas are not equal. Because of common grace, some have more truth mixed into them than others... and some are just true. On the other hand, there are systems of thought that are built on convictions about human nature that are quite contrary to Scripture. Most of the anti-discipline trend has been propelled by ideas born out of these philosophies (Rousseau, Freud, etc.). Even these philosophies have some truth in them... it's just that what's built on these kinds of foundations has to be greeted with great suspicion. As for the impression that some of the "grace based" and similar strategies favor lots of "little talks" over active correction... this impression hasn't developed in a vacuum. The quotes I see--and linked sources, etc.--are full of anecdotes to that effect. We've had other discussions on this in which one person or another seriously questioned whether parent's should ever do anything to intentionally cause a child pain. That's not an anti-spanking position; it's an anti-discipline position. Nobody here believes that Christians should teach kids "just be good and you'll go to heaven." And giving kids this impression is not as easy as some suggest. I grew up in a family that was quite strict (by most people's standards), where firm discipline was the norm, and spanking was not terribly unusual. Somehow this did not prevent my parents from communicating the gospel clearly to me, and my earliest memories of reflecting on my nature and need were completely square with the gospel. My parents were raised the same way and theirs were raised the same way before them... all believers, none of them moralists. How can this be? This is why i linked to the Elyse F. interview above. She explains this very well. Books are different--Grace-Based Parenting is very theological/why oriented. Not so helpful with an active 2yo, but good to understand the why of your parenting. Stuff by Wm and Martha Sears is very tool-oriented--here are 10 things to do when your child does X. I like Ross Campbell the most because he teaches parents how to communicate love to a child, and various steps of teaching to go through before spanking. Learning how to communicate love to my kids has resolved/guided many discipline moments in our home. I think the discipline/childrearing we discuss here is touching a different issue. It's how we communicate sanctification and our day-to-day standing before God to our kids. Fitzpatrick talks about this in that interview, and I'm not sure I can do a good job of it. This is also why I love Martin Luther's "Concerning Christian Liberty" (liberty referring to our freedom from salvific works in Christ, and how our life then become service/love to man, as Christ's life was to us, not a question of how God views me or deals with me or accepts me). I think most of us do not understand how the Gospel is our sanctification as well as our salvation. And that is more what the discipline/childrearing issues focus on. Would you clarify this a bit, Aaron? Especially what the portion I bolded? If you just mean physical pain there, then I disagree with your conclusion. If you are using intentional to mean that the pain is contrived, then I disagree with your conclusion. Parents can effectively discipline without causing physical pain. I agree that discipline involves emotional pain through one's will and desires being thwarted (so that meets your proposed pain requirement). And, I do not believe that the emotional pain must be contrived . . . setting and enforcing limits generally creates sufficient emotional pain without having to "tack on" additional emotional pain through unrelated consequences like losing t.v. privileges or something. Parents can effectively discipline without causing physical pain. How do you define effectively? If scripture is the measurement, then no, you can't. If culture is the measurement, then you and Anne have nailed it. The issue for Christians should always be scripture, and not culture. In what way is your "biblical" definition of effective different than a "secular" definition of effective, James? The biblically based parenting model seeks to teach children about the one true God. This would then require obedience to what God says. The secular mind could not care less. Culture standards are always rethinking what God plainly says. One thing God plainly said is that if you do not spank, you do not love. Culturally minded folks have tried to reword, redefine, and simply ignore the clear meaning of scripture. You can see some perfect examples of that by the links Anne gave in addition to her own twist of the truth. How does the Bible define effective, James? If you are simply stating your (already incredibly clear) opinion that the Bible requires spanking as a primary means of discipline, that's fine, no further comment needed. I took the chance and responded because it sounded like you might have something new (Biblical definition of effective) to bring to the conversation. Rachel, effective by the measurement of faithfulness. Noah was an effective preacher because he was faithful, not because of mass results. Faithful parents are effective in God's eyes when they do what He says. Glad to clarify if I can. Parental discipline involves, at minimum, the intentional use of negative consequences for wrong behavior. What makes a consequence "negative" from the child's point of view is the pain of it. Pain takes many forms from disappointment, to loss, to grief, to sorrow, to temporarily sore backside. Pain and "harm" (or "injury") are not the same thing and must be distinguished (the way many lump them together is intellectually dishonest). The primary test of what kind of pain/negative consequence (a.k.a. "rod") a parent uses is effectiveness. Small children readily understand pain as an immediate consequence in situations where other kinds of correction are confusing (because of the level of thinking required to connect act to consequence). Kids need to begin developing moral perspective (to think in terms of right vs. wrong) long before they are old enough to understand the gospel (the gospel is predicated on "wrong" and "sin" being terms that carry real meaning). The use of real discipline (a.k.a., negative consequences, etc.) is not compatible incompatible with teaching the gospel. There is no disjunction between the two. Finally, even in a soteriologically-driven approach to parenting, it's evident that sinners must learn law before they can learn grace. Good parenting begins with law, and teaches grace in that context. There's probably another point or two, but that pretty well summarizes it... and maybe it helps focus the debate--at least my part of it--by putting some essentials in the form of short, clear propositions. Edit: I need to say thanks for the tension and the questions... I feel like I'm reaching a clarity with my own thinking on these things now where much was just sort of intuitive before. So the conversations have forced me to pull these ideas out into the light and really look them over.